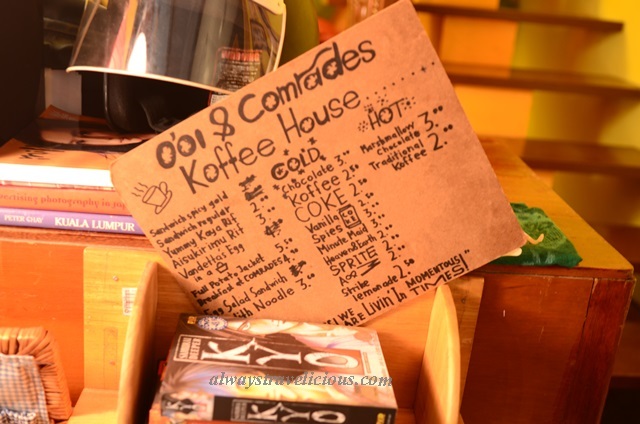 O'oi and Comrades Cafe @ Ipoh - Always Travelicious ! O’oi & Comrades Cafe & Saloon (halal) is located in the residential area not too far away from the airport in Ipoh. I’ve passed by it a few times. Seeing the big graffitied scissors on the wall, it always reminded me of Edward Scissorhands. 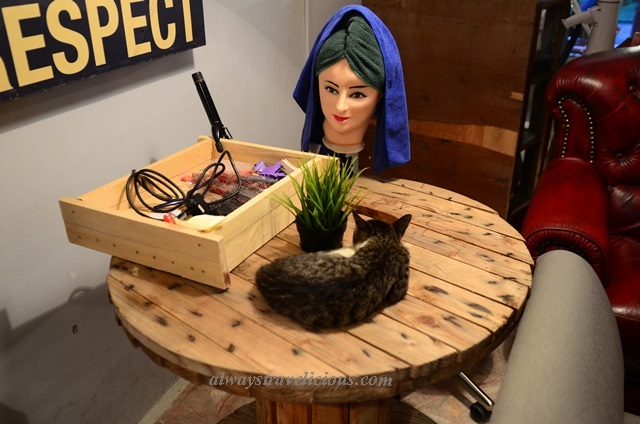 There’s no crazy Edward Scissorhands inside the bubgalow; just a friendly, lanky hair dresser that has made his name in KL and now is back to hometown Ipoh to do business. Since I needed a trim so I asked if he could quickly trim my fringe. Unfortunately he only cuts hair for boys, sorry ladies. The unassuming bungalow houses a quadruple combination of cafe, hair saloon, thrift shop and the most unlikely addition of custom bikes. The cafe has an unusual decor of vintage funk with vintage bikes and Suavecito Promade posters that feature an amusing skeleton man as the spokesperson. The cafe’s vintage mix of eclectic items – old typewriter, camera,baseball items, crochets of Micky and Donald, and one big shuttlecock that’s hanging on the wall. Wonder if these Givenchy and Ferragamo belts are vintage too? This homey corner which would have been a household’s living room is well, still the living room inside the cafe. The menu here is fairly simple with mostly sandwiches and it’s the most affordable I’ve seen with hardly anything over RM 5 except for the jacket potatoes. My chocolate with marshmallows was a delightful cup of sweet warmth – and pretty worth it at only RM 3 considering that some of the coffee shops in Ipoh are charging RM 2.50 for milo. This is the “regolith” noodles (RM3.50) on the menu. I didn’t really know what it meant and I just ordered it as I thought it was mee goreng or something like that. Turned out that “regolith” is a geological term that means “layer of unconsolidated rocky material covering bedrock” – Maggie mee soup would have been much easier. Well, maggie mee is maggie mee and you can’t go wrong with the cooking. Kudos to adding colors with chilli powder and green lettuce for food presentation. Old sewing machine is put to good use and transformed into coffee table. Perhaps the cafe is more well known in the Muslim community and less so in the Chinese community, I was getting curious looks from the patrons inside, wondering if I came to the wrong place. Besides that I was getting extra attention, the overall experience was enjoyable with the friendly owner and very affordable food. Address : No 20, Jalan Lapangan Terbang, Kampung Melayu, 31350 Ipoh, Perak. Ipoh is small so when something new opens, the word spreads around pretty quickly ! Not bad you! how come you know maju rapat? I don’t know how much he charges for haircut because he doesnt cut for girls so I stopped there… you can ask him on his FB page ! OK, this is very interesting. Feel like dropping by for a visit. you can go there when you need a hair cut ! 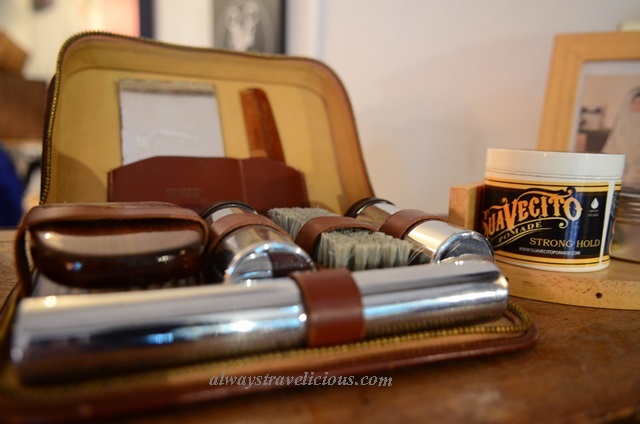 Pingback: 34 Cafes to visit in Ipoh | Always Travelicious !